Yeah, there was originally supposed to be 3 different covers/booklet combinations, but I guess Best Buy or Universal nixed the idea. But there were some printed up - I have no idea how many. The liner notes and lyrics have the same typos as the booklet we all have. I know someone who has the "hand cover" booklet. This person has described it to me and offered to show it to me in person, but they live 3000 miles away. I think they've been scrapped (like the "Better" video). The best we can hope for is that they use the grenade or the "From Russia with Love" artwork for CDII. I was never excited about the Better video. Cut up live footage not what Chidem deserved. Bach put out a video for Love is a Bitchslap and it was all cut up live footage(which was boring as), Chidem deserved much better. But i guess Axl didn't wanna do a proper video ala November Rain. I'm working on a fan made version that I'm calling "The Better Video." Not to be confused with the "Better" video. I've been thinking about it more lately but i reckon the record label didn't want to cough up the massive dollars needed for a proper video considering how much cash they put into just the music. Given that Axl was paying for the production of the album after 2004(i think that was the year), the record label didn't want to invest anymore into it. And Axl probably didn't want to finance it himself because the label would be benefiting from it. Shame though because it would have made a massive difference, especially if Better was the first single too. Although i think that if it didn't have a video but was the first single it wouldn't have fared much better then the title track either, music videos are needed. Notice the CD itself also has a different design - and a glimpse of the alt. artwork for "Shackler's Revenge." There was fully realized artwork for that two-disc Greatest Hits floating around the net a while back. I can't remember. I never saved it. But the artwork was way cooler than the one disc one. 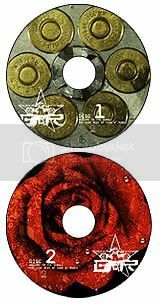 I think the image on the disc was like the bullets in the revolver. I'm sure someone here knows what I'm talking about. Wow Bonham really cool pictures of the CD alt. artwork! the CD itself has the star design, right? The cover artwork is ugly, but the CD itself design is amazing! Congratulations to the person who did that, good work. In the concert in SÃ£o Paulo, eariler this year, I saw many of the artenaltive artwork on the screen. And during some musics, there was a clip on the screen. As I was very close to the stage, I didn't pay much attention to the screen in the concert, but later at home, I could notice that in sequence, the videos of Sorry, Street of Dream and Prostitute tell a story. Hey Bonham, take the /s400 from the Street of Dream Single pictures URL to make it bigger. 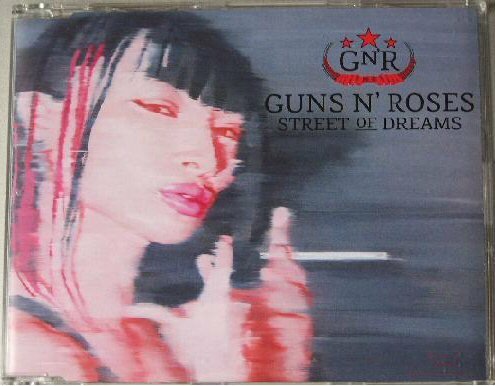 The Street of Dreams single artwork is what appears in the alternative Chinese booklet for that particular song. When did we hear this? Another shot of the box set. I saw that in HMV the other day. They're doing a sale of loads of rock stuff, and even had a big stand for Guns N' Roses beside Green Day, selling all albums in deals (Â£10 for 2) I believe, with those boxsets and some t-shirts. It was pretty cool. I also saw a big brand clothes shop selling Guns N' Roses socks. I love that it comes with a hanky for your lonely teardrops. We have to get more photo shots of the alternate booklet(with the red hand on the cover)!!! It has the leaked artwork in it. 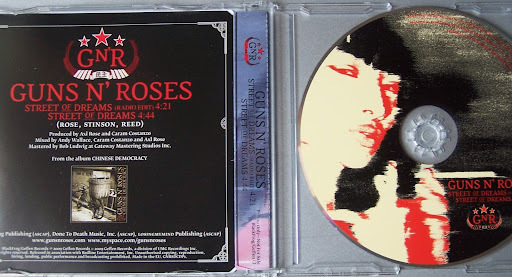 Bonham do you know the guy who owns the Red Hand version of Chinese Democracy?? I cant find any copies on Ebay. Yes, I do know someone who has the "red hand" version, but as I said earlier in this thread, my friend won't violate the copyright and scan the pictures. My friend offered to show me the booklet in person, but I live 3000 miles away - so that's not going to happen. I don't know how many copies were printed - my guess is about 100. They are promo copies. None were sold through Best Buy. They have been spotted at Amoeba records in Hollywood, CA ($100), on a Swedish auction site (similar to eBay), and in the hands of various collectors and insiders. What I look forward to is incorporating the new artwork into our merch and getting some for myself. I think u'll like a lot of it. My vote's for the How Are You grenade and the Sorry automatic rifle artwork on shirts etc. Any idea what the swedish site is called? Im pretty keen on getting this. Also would scanning and printing off the pages be considered copyright infringement?? Irrelevant. My friend ain't going to do it - this person is a "friend" of the band.